Seems I'm never going to finish this, for it has been collecting dust on my desktop for, say, a month. So, here it is... Made of 16x16 tiles. Added a few rock tiles to the bottom of the floating islands. Also recovered bridges that were missing in the actual download, while still being in the preview. Did a quick dirt path. CC0. That's what I love about OGA. Within a day, 2 people had already extended the tileset! Here's a bad attempt at creating a waterfall. 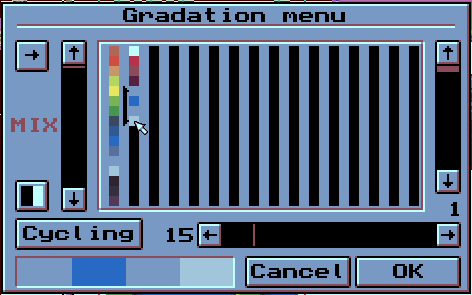 It assumes the colors 20-24 in the palette are cycled forwards (which is pretty much how some old games did effects like shining coins and, yes, waterfalls). The first image is the original, the second displays the animation in GIF. Here is a little mockup of what it should look on a TI calculator with 4 shades of gray. I like this set a lot. Hope it'll have a lot of expansions. I added too a little addon to blend correctly holes in little maps. 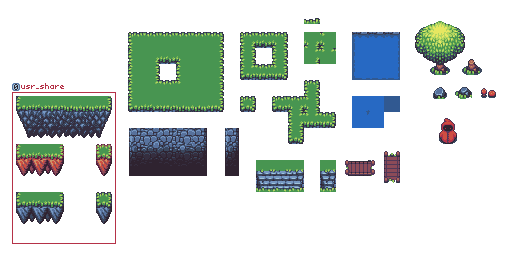 I will be using this tileset inside my 2d rpg game I am creating. Thanks for the awesome tileset! It'd be cool if we could keep adding and modifying this to have a really awesome little tileset. I am not much of a pixel artist but I've added the other end of the bridge. I also noticed that there was no flip side to the other side of that rock wall. I hope this helps you as it helped me. There's nothing wrong with the horizontal bridge. It's comprised of 3 tiles already. Might be so, but it will create complications on a linear 16x16 read of this picture. Plus, don't forget, the bridge would have an awkward gap of one pixel making the bridge's planks slightly bigger. I am 17 years of age. @Kemono, @Hydroque: Hummm... I don't seem to understand either of your edits. Both the vertical and horizontal bridges are already composed of three tiles (a middle one and the two extremes). Also notice that the extremes are intentionally made to take a small portion of a tile, so that bridges seem to begin on cliff borders. The only issue I notice is a half-tile misplacement of the horizontal bridge with respect to the grid, but that's not much of a problem. @Buch I am sorry to of confused you. Yes ideed the tiles are correct, but be aware that reading a map like this takes two things. It be one tile per 16x16, and not have tiles intertwined with other tiles. Meaning I can't read a tile inside another tile. It has to be snapped to a 16x16 grid unless I get really fancy with my loading which I am not going to do because it is a huge waste of time. Also check out my rock wall edit. I also uploaded another picture over mine that is more new. My bad, there was nothing wrong with the verticle bridge, I measured it wrong, heh. 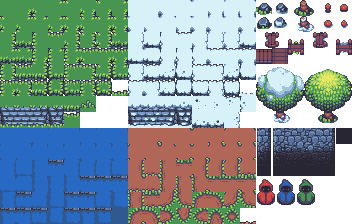 To make up for it, I fixed the left and upper water border tiles so they were more consistent to the perspective and added sides for use as deeper water tiles. Also fixed the rocks, mushrooms, they were on two tiles which was wasted space so I moved them to one. I thought perhaps you'd meant for it to be used as a fringe/block thing, but it wouldn't work given the size. Stump was too close to the tree for mapping, so I moved it over to the right. It also takes six tiles (?!) it could easily be on four, more wasted space! It's now on four tiles. Also, for the big tree, it now takes up 16 tiles instead of 20 and is centered with 7 pixels of space either side. Last but not least, the straight edge of the top edge tile was bugging me, so I changed it. 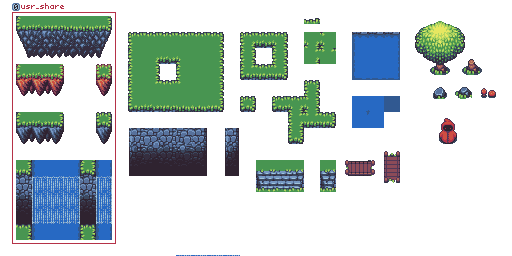 That's all for now, going to keep adding bits to this over time, I've got some assets from my own custom tileset that will go nicely with this one with some recolouring so I might throw those on here. Keep at it all, this is a nice style and would be great to see as a game. You can do a decent amount with the current tiles. I'd like to know more about your project, you talk as if you're programming it yourself. @Kemomo I suggest using @'s to address people. I am programming it myself. I am using LWJGL (OpenGL bindings and tools) to create a 2D game. If you want to know more I recommand sending me an email at maroonrs2@live.com. Here is not the place for chatting about that. @Buch I was assuming that the bridge with handles were part of the same (Thus being 32x32 without my extension) though to put it to use I had to split the middle into a seperate tile in order to use, for i used the handles + some of the bridge as a tile. Hydroque - "One Tile Per Square" @KemomoI was wondering if bubbles could be added to the waterfall's bottom. It seems strange to me. It looks more like rapids. I sent you an email. Steam would be preferable. My username on Steam is the same, as is my avatar so I shouldn't be difficult to find. As for the waterfall, there is a single height fragmented line at the base and top of the waterfall which are supposed to be bubbles though they are hard to see, I would imagine that a seperate animation layered on top (similar to a spell animation) for bubbles would be better, that way you can use the seperate animation elsewhere. @Buch this is what I have to do with the textures. Would it be possible to make these into 32x32 textures? 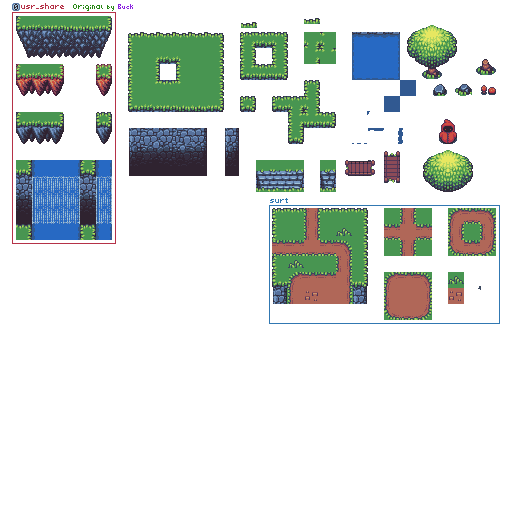 "PICTURE REMOVED TO SAVE SPACE"
At any rate, I've made a packed tileset, containing all the original tiles plus the edits and additions made by surt, usr_share and Kemono. It does work well in at least two popular map editing programs (Tiled and PyxelEdit), and I won't change that layout anymore. Also, @Hydroque: what do you mean by 'making these into 32x32 textures'? Do you want the tiles to be 32x32? Or do you want to split the image you posted into 32x32 pieces? All compiled into one, you're right, works great in Tiled. Hopefully I'll get my name up there as a contributor when I actually get around to adding something, haha. Here is a screen shot of a possible map I could make. I found the water a bit lacking. As you noticed I am forced to use the rock-based bottom water tile. I will try to work around with extending it to see if I can't normalize it. That's some easy stuff to fix. @Hydroque: a 32x32 version of the tileset is not in my plans for the immediate future. Noticed a need for this tile. you could leave it flat, but I prefer the grass up against it look. I took some grass from the stairs and rolled with it. Also changed the grass decoration thing, wanted to give it more of a curved look. Kept both though. 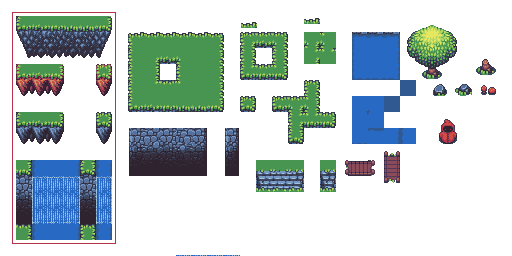 I'm taking a while to add anything, I have to go back to photoshop from Paint.NET which is far superior in everyway except for the fact there's no resizable grid in Paint.Net for tileset. Yea I've tried Graphics Gale, the interface feels like I'm on a Win.98 machine again. Paint.Net works great for me, I just wish I knew how to add plug-ins and whatnot so I can add features like an adjustable grid myself! Is your waterfall complete? I don't think you upload all of the frames for the waterfall to actually animate. Yes, it is. In my original comment, the PNG has an indexed palette (the later comments broke it). In this palette, the colors 20 to 23 are supposed to be cycled. The changing colors will imitate animated water. After that, the waterfall will look just like in the GIF I posted. This method of imitating animation was also used in lots of 8- and 16-bit games. For a modern example, OpenTTD uses color cycling exclusively to animate water movement and city lights on the map. I have no idea what that is and I don't do openTTD, all I know is that when I put it into my engine and line up the tiles, it doesn't animated properly. Ah, Didn't think of taking the frames from the gif. Wasn't able to get the frames. I guess I'll just work on animating a new one based on yours. @keith karnage: hello and welcome around here! I looked at what you did. I suggest to use the blue-ish darkest color as a background color rather than black as it would help the transition of the tiles into empty areas and does help with the tile seams as well. In any case, keep up! I'd be happy to see something done with this assets. As for your edits, they look useful to me, as they add all them T-joints I never have the patience to make :) It would probably have been easier to post them here so that they stayed in a single submission, though... Well, I'll add a link in the description. 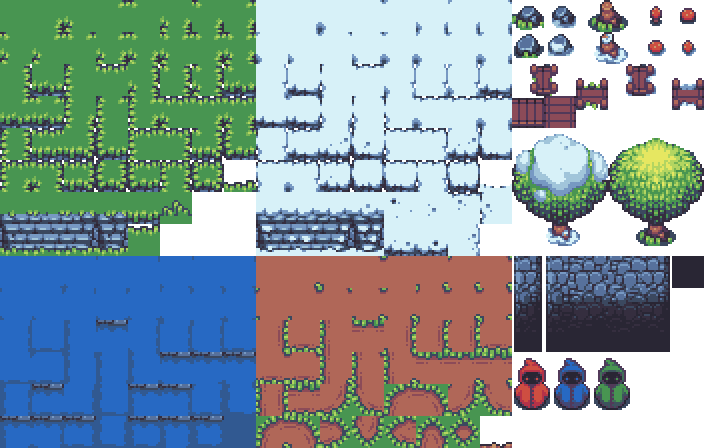 I've included an expansion with snow tiles... See the edited description for more. Enjoy! Awesome art! Love all your stuff! Thank you for sharing! Really nice that you put it under CC0. Used this amazing tileset in our free android game, Muulore's Quest! Nice art dude!! :). Anyone know what is this view? Is not isometric is? Thanks! 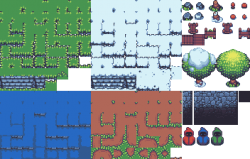 Just to comment on this from the past, but my biggest problem with these images is they didn't fall along a pixel grid which made it impossible to scope out the tiles. So I compiled it or I split all the images up into their own file first. Wow. This reminds me of a combination of Mother 2 and the Dragon Quest remakes for the DS. I used your beautiful pixel art as part of a project to learn coding by making a small game. Thank you! Hi, these are great! 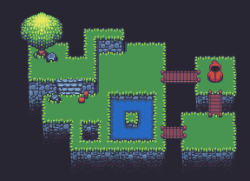 I'm using a slightly edited version of the grass tiles seen here in my survival RPG game, I've put you in the credits with a link back to this page. Your pixel art skills are phenomenal.